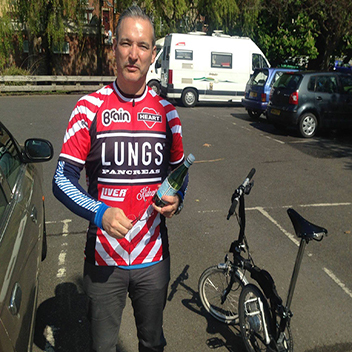 A Highbury Fields "Lads and Dads" veteran, Simon joined numerous after-footie, ride planning sessions at the Compton Arms last year. And rather like his inimitable progress to the top of Mondays' 5-a-side stats, he has purposefully jostled, hoofed and danced his way into Brest2Ars. 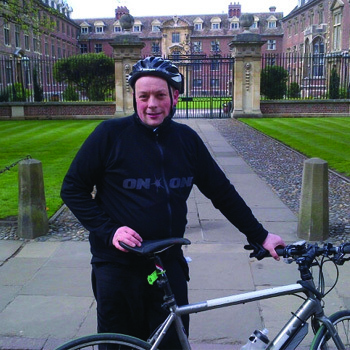 "...Last year my only contribution was unlocking my credit card and blowing off the cobwebs, this year I’ll do the same to the bike; either way I’m glad to help raise money for important charities. For the last few years I’ve been using a bicycle to potter around Hackney and Islington. Sometimes my more adventurous trips have taken me as far as the exotic western reaches of Chiswick and the southern outcrop of Lewisham; with this experience under my belt, what could be more natural than setting off on a 500km ride across the wilds of Brittany? I’m hoping the west coast of France will be a bit like the Lee Navigation – keep the water on your right and you’re going the right way – but just in case, I intend to follow JB. After last year’s ride, most of the talk in the pub was about the Breton sea food, inveigling waverers like myself to commit before we looked at the map in the small print. 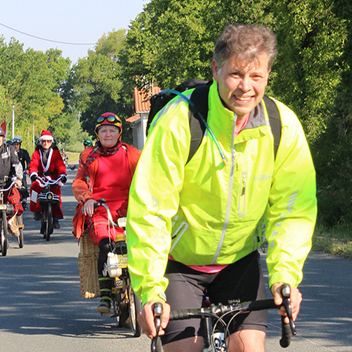 As I work for a French company based in Bordeaux, I’m hoping that by riding the extra 100km to head office I can convince my boss it was all work time really…"
Sean Wightman's the only one brave enough to ride the 500km trip for breast/prostate cancer causes on a Brompton folding bike! Sean spends his daytimes as tech support to the rich and famous. In his spare time, Sean specialises in alternative forms of transport - some of his vehicles can be seen in varying states of being fixed on his Facebook page. He's been riding a 3 speed Brompton for the past 10 years and has recently upgraded to a custom built Brompton Alfine 11 speed. Sean's other bike is a Dahon Jack (which also folds but not very well). He was determined not to get a full-size bike as he believes it's a very slippery slope. He does admit that since taking up cycling again (and subsequently getting the bug), that he's definitely reaping it's obvious health benefits. He also concedes that it's probably only a matter of time before he starts pounding the streets of London on a carbon fibre race bike dressed like 'Tron'. 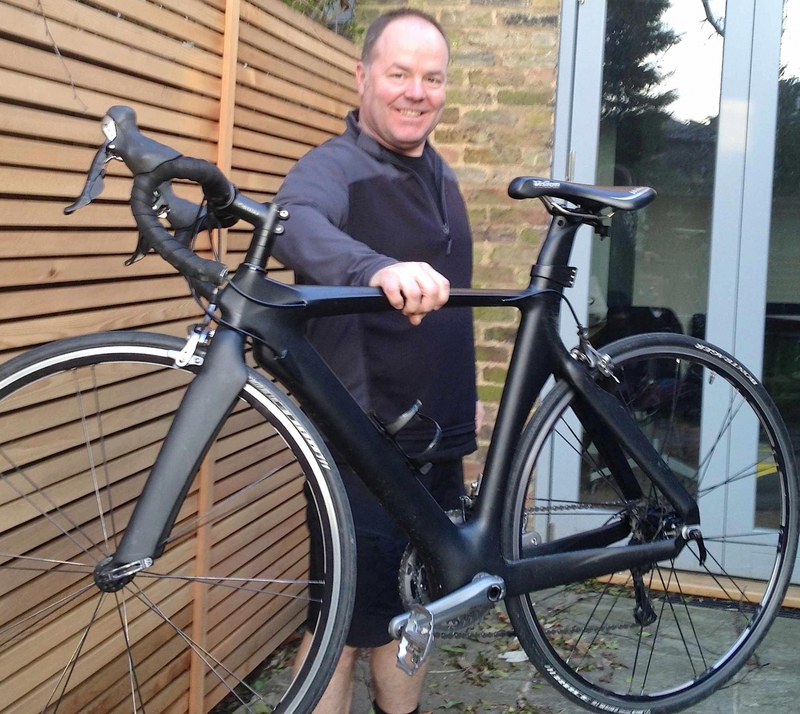 His full size racing bike was last seen in around 1992 locked to a lamppost during a night out in Guildford. It may well still be there. He has been riding a minimum of 20 miles a day in preparation, and is currently saving a fortune on taxis, petrol, and public transport. Sean is very much looking forward to going from Brest to Ars and hopefully raising some money for some worthwhile causes. Loves cycling. Hates social media. Despite having a big profile in the IT industry, Jerry leaves no digital footprint. So it is useful that we can be as rude as we like here without Jerry ever finding out about this post. Jerry has looked after his cycling equipment well. One of his childhood bikes is still used by son Joe as a trendy fixie. His most recent bike however hardly ever gets ridden because "something could happen to it". So as Jerry claims to be a fit, marathon/triathlon kind of person, we have forced him to fly to Brest to liberate his lovely Condor. After a few training rides, we've worked out that although he doesn't like hills (join the rest of the club, Jerry), he's still got the stamina. But he has some problems to sort out in the trouser department. It hailed and rained a lot on our first trip, but that should not have caused Jerry's vintage shorts to surrender to gravity, leaving the padding sodden, semi-suspended and squishing around somewhere between between his thighs and knees. On his next ride he wore more streamlined trousers. But the new modern cut does not seem to provide the full amount of fabric needed to cover all of Jerry's bottom. It is with some trepidation that we await Jerry's Ars wardrobe, but we will at least have a place to park one bike. Jerry is rarely seen without shades, so you can never be sure he is awake. 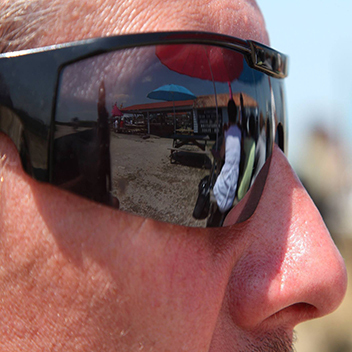 The reflection seen here is actually a wonderful place on Il de Re (an oyster hut called Cabanajam) and we all look forward to seeing Jerry there again on May 25th. "...Too old to fall into the “middle-aged men in lycra” (MAMIL) category but not old enough to know better, when Lu mentioned a bicycle ride through France it didn’t take long to weigh up the pros and cons of spending time in the saddle against spending another day in the office. 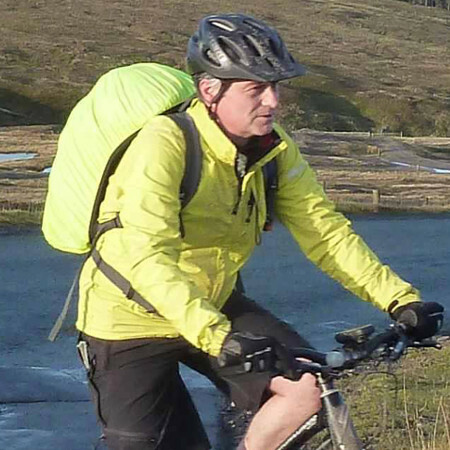 Having decided to go, a problem occurred to me - my vehicle of choice is a mountain bike and although its a long way, there are not many mountains on the route. Luckily I can still pull rank over my son so I'm take his road bicycle (fair enough as I paid for it!). The seat looks rather unforgiving though. I’m not sure why it has to be stream-lined and I can imagine that there will be tears before bedtime. This is a good point to mention that apart from having a mini-adventure we will be raising money for a very good cause. Cancer is something that has affected a number of friends and relatives and I’d love to think that we could be helping to find a cure or at least providing help to people it affects. If all goes well this year the trip I like the sound of extending the theme to visiting other places with body part names, my favourite suggestion so far being Nepal (you have to saying this fast!). Now can someone help fit some cowhorns to my bicycle?" "...I have loved cycling since I was a little kid, going for long rides around my home in Northumberland. When I moved to London I was given a battered old racer and cycled to Uni and then started commuting to work. It has got to be the best way to get around the capital and I always harass friends and colleagues to try it. They often mention the safety aspect of cycling in the city. Although I've always been safe cycling in London, I must admit one of the things I'm most looking forward to about B2A is cycling in rural France without worrying about cars cutting me up. I work in Regeneration, implementing programmes to make London more people-friendly and to make sure that local people benefit from development in their neighbourhoods. Encouraging more people to cycle is a big part of making cities more attractive, healthy and safer. When my partner came back from the pub after 5-a-side with his middle-aged buddies and told me about the Brest2Ars idea they had been cooking up, I couldn't resist the challenge. As he claimed he wouldn't dream of spending 8 hours sitting in a saddle, I had to represent our household. The opportunity to trial the route and then build it into an annual event is exciting. It will be great if we can go on to raise significant funds to support Breast and Prostate Cancer Care over the years. It will be interesting to be the only woman doing B2A in 2014 again, and I hope to pester more women to join me next year." Rising early from bed, a laser-like focus on planning and organisation. There is literally almost no start to his familiarity with these key skills. But Lui does know roughly where we're going. And luckily he is surrounded by more sensible riders. "...Although I've been a regular rider of my Condor Fratello around Highbury in London for ages, recent rides to Brighton, the UK Coast to Coast and the somewhat ambitious "Ride with Wiggins" have given me a flavour for longer adventures. 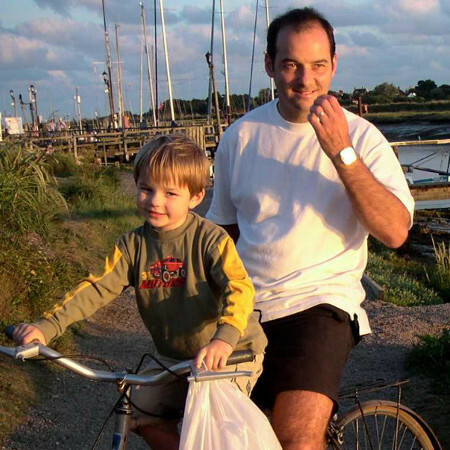 Ile de Re in France has been a brilliant holiday destination for my family and friends for many years, and cycling around the almost car-free island has always been a key part of the experience. Seeing my kids (now 11 and 14) chuckling at the signs to Ars on these outings inspired a ride to France, and I'm really chuffed that Brest2Ars has now become a serious reality. I'm particularly pleased that this wacky ride will also be raising money for causes that have deep meaning for me; prostate cancer seems to run in my family and breast cancer has deeply affected some of the closest people in my life so I'm proud to be raising awareness for charities that can help. I have a day job working as an account manager in the IT industry and I'll be spending time in the saddle thinking about cyclical projects. More importantly I'm really looking forward to a great holiday with friends and family in Ile de Re." Although modestly referring to himself as Captain Slow and worrying about the distance, JB is the one with a GPS and a knowledge of spreadsheets. He could be the only one to survive. "...I’m hoping to hang onto my new bike long enough to ride it the 500km from Brest to Ars. 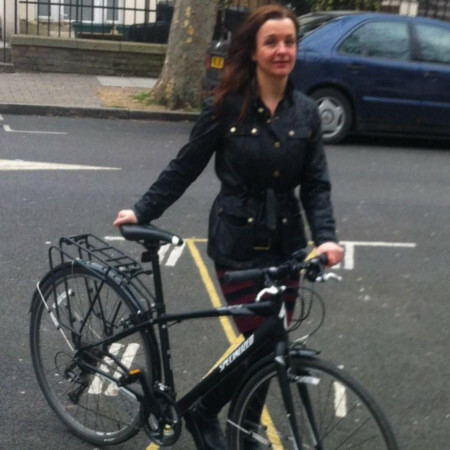 I was going to use my Swiss BMC bike but that got nicked from outside work a few weeks ago. So, with a bit of luck, I’ll be riding its replacement, a Whyte Sterling. Flat handlebars, disc brakes, clip in pedals. Not as fancy as Paul’s carbon fibre track bike but it should last the distance. After getting a double puncture in the pouring rain recently, I’ve replaced the tyres with puncture resistant armadillos and kevlar tape on the inside. So far, no punctures but it does seem heavier and crutially slower than before. My other bike (everyone’s got two bikes right?) is a rather nice full suspension Specialised Stumpjumper. It’s been up and down the Italian Dolomites and it soaks up London’s potholes and Islington’s speed bumps beautifully. My contribution to the group has been to insist on a support van and the adoption of kilometers rather than miles. You can call me Captain Sensible. I’m a bit worried that I’ll be bringing up the rear. We’ve Strava’d up and I’m keeping a close eye on the average speeds we’re recording on our practice trips. I can’t seem to get mine above 16km/hr and we really need to be doing 20km/hr if we’re to make each leg in daylight. Lu’s average speed seems to be hovering around the 26km/hr so (in true Top Gear style) I’m going to have to tamper with his bike to slow him down. If you like stats you’ll also be interested to read that Lu’s average power output on a recent training ride was 158w compared to my 52w. Perhaps he can pull me along. A friend of mine was recently diagnosed with cancer so I’m delighted to have the opportunity to raise some money and awareness in support of our two charities. I’ve been cycling in London for 27 years and been mountain biking in France, Spain, Italy and South Africa but this trip’s going to be quite a challenge. The distances are daunting. Wish me luck! We're chuffed to be joined by a proper, real life, trophy winning, English Channel swimmer. "... As a middle aged man I feel that is it my right to have a midlife crisis – this is a continuation of the normal age related milestones – becoming a teenager, turning 18, midlife crisis, pensioner. As part of this ongoing crisis I presented my wife with a choice of what I thought I should do - Buy a Fast Car, have an affair with a younger model or do some physical challenge. Luckily she decided that the physical challenge was the cheapest and less emotionally difficult option. 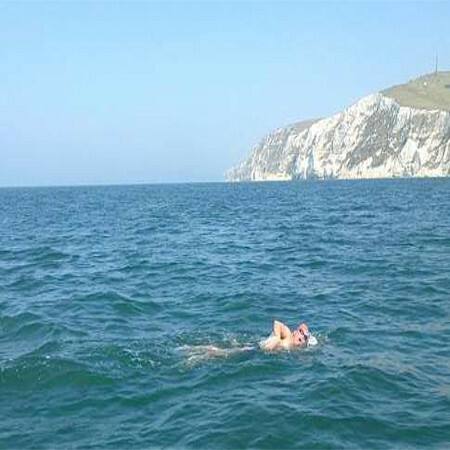 So in September last year I swam the Channel which is 21 miles from England to France, unfortunately my navigation skills were severely lacking and there were some strong currents resulting in me travelling about 45 miles. This is why I am leaving the route planning on the cycle ride to other more adept individuals with their GPS gadgets; I will be taking a traditional map (just in case). I did my Swim in aid of Marie Curie Cancer Care due to the fact that most of the Monday Football squad seemed to have had one relation or another who had been looked after by this charity. The thought of cycling for Breast and Prostrate cancer does bring a serious element to what should be a fun filled trial." "...I’ve always been riding bikes. Tomahawks, Chippers and Choppers were the bikes of my childhood. I never actually owned one, I just admired them from afar, while I had a 3 speed Raleigh with drop handlebars. Not cool. This was soon customised to include a set of cowhorns, but it still never had the cache of a bike with ape hangers and a banana seat. Eventually I did get a head turning bike. Made from bits of other bikes and mashed together for a school metalwork project. It included two sets of front forks welded together so the front wheel was impossibly far away, to the point that any forward pressure on the pedals resulted in a wheelie! But back then bikes where for sitting on and looking good. Now practicality far outweighs looks and anything that might make cycling easier is the preferred method of transport. As the years have been unkind, I’ve attempted to shave weight off the bike rather than myself. I’m now hoping that me and the Bat Bike will almost float the 500km from Brest to Ars. B2A is my second long distance run, having been part of the group that went from Coast to Coast in 2011. Already that seems a long time ago and doesn’t really constitute practice for this ride. Still, I cycle around London and occasionally to or from work in Hertford, so how much harder can this be? Plus we’re doing this one for a reason and that will hopefully add a few extra turns of the pedal. Cancer in its many forms touches most of us at some stage in our lives. I have a close family member who has just completed his treatment for cancer and due to the excellent and timely treatment he received the prognosis is now good. Unfortunately, I couldn’t find anywhere called stomach on this route. But maybe next year! " "...Amazingly, I was not put off cycling forever by my parents who decided that rather than buying me the 10 speed racer I asked for for my 13th birthday, they would buy me a 3 speed folding 'shopper'. My mum reasoned that if I had a puncture they could always come get me and fold it up into the boot of the car. I've had a problem with taking the sensible route ever since! Maybe that's why, when we were talking about our next challenge in the pub after the Coast to Coast ride, we dismissed all the practical organised rides we could have gone for and decided to start our own charity bike ride. Brest2Ars was then a result of our combined puerile senses of humour, Lu's desire to end up in Ars on Ile de Re and our personal stories of loss through cancer. A good friend of our daughter had just been orphaned by breast cancer and I lost my mum to it when she was just 58 so the start point of Brest was set too. All we needed to do was work out how far it was then! I commute 18 miles round trip to work each day so I'm not worried about the legs suffering, just my own ars. Work is a marketing type thing, I've been creative director of various ad agencies for the last 20 odd years and now like to dabble in all areas of the dark arts, PR, branding, digital, social and live events as well as still writing the odd ad. It has fallen to me therefor to teach some of the more luddite riders about Facebook and Twitter in order to help promote B2A. 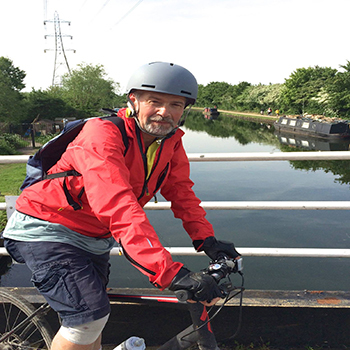 We'd love it to become a regular route on the charity cycle roadmap, raising bucket loads of cash and creating a lasting legacy to those we have loved and lost." "...A fan of geography based jokes, George joins the team as 9 of 8. He is a committed commuter and is not convinced that cycling is possible other than in close proximity to buses, taxis and other sundry traffic. He is bringing a commuter approach to the ride and is likely to be found on his flat-barred, pretty ordinary commuter bike. 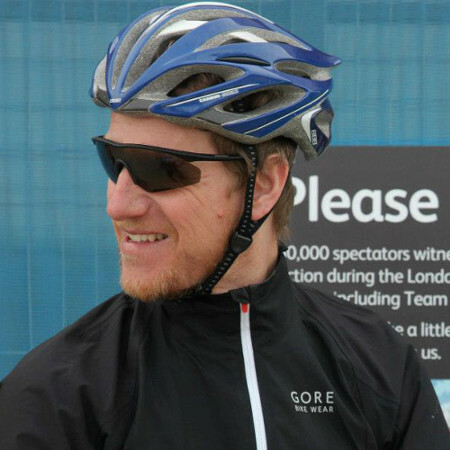 George started commuting by bike whilst at University on The Strand and has continued on and off ever since; it has increased his love of London and kept him fitter than he looks. Joining the team late has mean that George has managed to evade much of the long distance training. He is not a classical athlete and so has a wee bit of catching up to do. He is really counting on those commuting miles making a difference. His only other longish distance rides have been to Dunwich a couple of times in July, a ride he loves. By day George fights with machines in the city, encouraging trading systems to play nicely together, by night he fights for time in the bathroom at home, no mean feat in a house of three daughters. George is worried that in joining the team he is unable to offer much in the "playing five a side football" front but is told by his family that he scores strongly on the "talking rubbish about bikes" front. Breast cancer has affected a number of George's extended family and a prostate scare in another family member has really shown the terror that these things cause. It is sobering to think of these things and these will no doubt be a motivation to keep going. I've already had one pal say "Boy, you are going to suffer, that's worth digging deep for" so I am hoping that others will feel similarly.